I am sure this building Casa Mila also known as La Pedrera rings a bell. Maybe you saw the picture somewhere, in a postcard or in some expensive art book. Perhaps you are lucky enough to have visited Barcelona in the past and you wouldn't say no to a second or a third chance to see it. Well, it is never like the real thing, absolutely not, but if you click on today's image of the ironwork on one of the front balconies you will enjoy a very, very close shot of the famous façade. Not that there are few images like mine, but certainly you will appreciate every detail of the floral motifs. 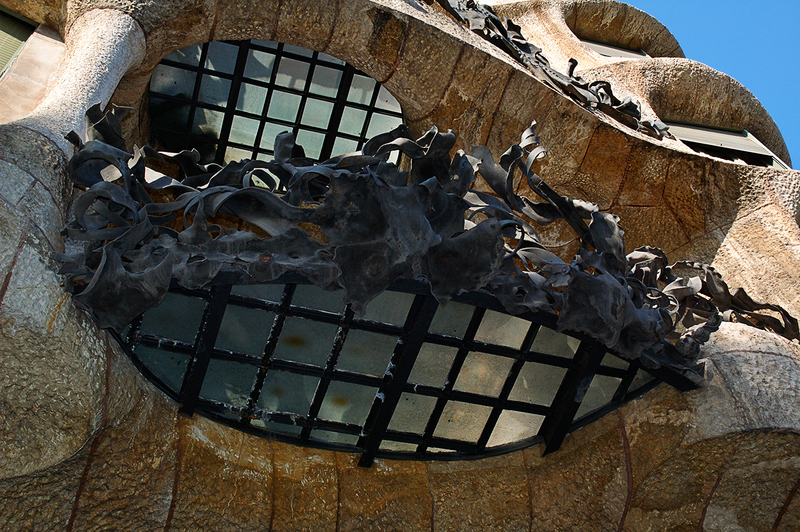 For more information read Casa Mila and follow the rest of links in the post. I will be in Barcelona for vacation in August for 2 weeks. Your blog just got me very excited. Thank you. Welcome to Barcelona greenbeen. I wish you a nice stay. Estive ali, é de facto um belíssimo edifício, desde um fabuloso telhado, aos interiores, até a este desenho das janelas, é realmente muito bom. Hello Carlos - I visited Barcelona a number of years ago, and the Gaudi architecture -- this building, and the amazing cathedral -- are among the most memorable sights in that city. I love this photo. It makes memories of Barcelona come flooding back. What a gorgeous building. Your previous entry's photo is also lovely. I've always thought that the balcony railings looked like what happens to pieces of paper that catch on fire. I enjoyed looking at this unusual sculpture. Thanks for the closeup too! Thanks my friends, just imagine how great it is to stand right beneath this balcony. The building is really impressive.